Mexico and the European Union are working to wrap up negotiations on a new version of their 17-year-old trade deal by the end of the month, the Mexican economy ministry has said. The two sides have been in talks on updating the trade deal since May 2016. After making rapid progress on issues including market access and intellectual property in their sixth round of talks, negotiators will now hold a series of video conferences in a final push to conclude the deal, the Mexican side said. They will meet again in Brussels from December 11 to “outline a possible conclusion of negotiations” the following week, when Mexican Economy Minister Ildefonso Guajardo travels there to meet with EU Trade Commissioner Cecilia Malmstroem, it said. That progress stands in contrast with the bumpy negotiations between the United States, Mexico and Canada on updating the North American Free Trade Agreement (NAFTA). Uncertainty over the future of that 1994 deal — which US President Donald Trump has made a ritual of attacking — is weighing on the Mexican economy, which depends heavily on trade with the United States. Mexico, which sends some 80 percent of its exports to the US, is looking to diversify its trading partners. 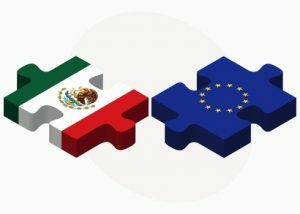 “Modernizing the EU-Mexico Free Trade Agreement is a priority in Mexico’s trade agenda seeking to strengthen our integration with existing trade partners and diversify our economic relations around the world,” the economy ministry said. EU-Mexico trade has nearly tripled to $61.7 billion under the deal. But that is still dwarfed by US-Mexico trade, which totaled $523.8 billion last year. Unions have consitantly warned that the trade deal will do nothing to help resolve the attack on trade unions in Mexico, the development of ‘yellow’ unions and the attack on employment rights. Mexico continues to systematically violate international labour standards regarding freedom of association, the right to organise and collective bargaining, corruption and conflict of interest in the Conciliation and Arbitration Boards, the pervasive use of employer-dominated “protection contracts,” (which allow for non independent company or yellow unions) and delays in union representation elections. Unions such as Unite has also said that there was continuing gender discrimination, child labour, and violations of workplace health and safety among also serious ongoing problems. Unite said these violations have been extensively documented in the reports of ILO supervisory bodies and independent experts. Read the back story to this item by clicking here. This entry was posted in Campaign For Trade Union Freedom News, New Generation Of Trade Agreements. Bookmark the permalink.